For the past couple of weeks I’ve been holding steady at 202, and more than a little bit frustrated. I know, I know, losing weight takes time and effort and we don’t see progress in every week. But I was so ready to break that 30 pound barrier it was killing me. So today before my morning run I hopped on the scale to see, just maybe, if I’d lost any weight since last Friday. Well, well, what did I see? 201! Finally! I’ve lost a total of 30.5 since July 20. I feel awesome, and not ready to stop! Next stop: 40 pounds. 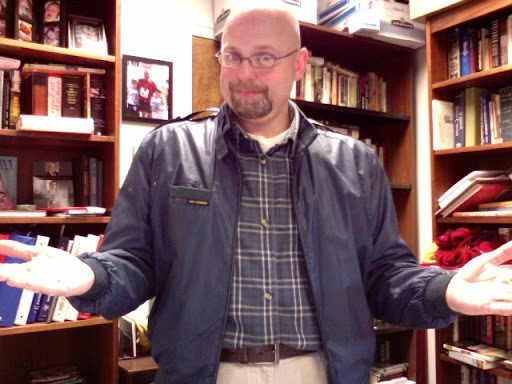 I’ve lost enough weight to fit once again in my 1983 Members ONly Jacket! NO! I don’t plan on wearing it in public! Congrats on your weight loss — you must feel great!!! Congrats on the 30.5! Keep up the great work. Go Gordon go! Go gordon go! As someone on my own weightloss journey, I know how important those milestones are! Congratulations on some great work in losing that weight! Congratulations Gordon! that is fantastic!! I have a long way to go…but hopefully can make the same progress as you!! Congrats Gordon! You ROCK!!! Keep it up! Goofy's Race and Half! “KEEP MOVING FORWARD!” That is the mantra for the next year! Looking forward to January 2011! You should wear that jacket in public. It looks good on you! Congrats on the weight loss. Way to go! So funny. I saw the Members Only jacket and I thought “What?” Good to know it's not going to be in your normal wardrobe rotation.